Back when we were dating, Naoto and I had dinner at his coworker’s house. I don’t remember what we ate for dinner. What I do remember is Joyce and her husband, Doug, offered up mango salsa as an appetizer and…it was so good. You know how when you’re at someone’s house–especially someone you don’t know very well–you shouldn’t make a pig of yourself and eat the entire bowl of salsa? I think I broke that rule. I couldn’t stop…it just might be the perfect (non-tomato) salsa. It’s sweet and tangy and the textures of the mango and black beans and onions work together perfectly. Monday night Naoto made the salsa for the first time in a long time. We have a photocopy of Joyce and Doug’s handwritten recipe in our recipe box…I think it’s the first shared recipe of our relationship. And this is why I love handwritten recipes! Just poking through my recipe box reminds me of Joyce and Doug and the beginning of my relationship with Naoto in a way that no link to an internet recipe ever could. Anyway, Naoto prepared the salsa to put on fish and I had to restrain myself from eating the whole batch with tortilla chips before he cooked the cod. I think the salsa is really best with chips, but fish is probably healthier…either way, make this salsa! Mix together; stir thoroughly; chill for 1 hour. Serve with chips, or on fish if you’re feeling fancy. The dish wasn’t hard. There were a lot of steps and some techniques that we’ve never tried before, but dinner was worth it!! There was so much flavor packed into this dish! And it fed us for three days. Naoto makes a really delicious beef stew, but the flavors here are totally different. We want to make it again this winter, and add more carrots and leave out the pearl onions just because they weren’t our favorite thing. (Don’t get me wrong, they’re good, but we prefer carrots and Julia only uses one which had us arm wrestling for the few bits in the dish.) We also served it over pappardelle on the second day and it was sooooo good. One thing I would recommend, and I’m feeling this way about almost all recipes lately: get the cookbook! Whether you buy it or borrow it from the library, cooking from cookbooks has been so much easier for me than constantly running to the computer or waking up my phone. (I know you can change your phone settings but, I don’t.) The beef bourguignon recipe is in three separate places in Mastering the Art of French Cooking and we were constantly clicking on different links and it just would have been better to have the cookbook. I’d love to know some “complicated” dishes you’ve made that are worth the time and effort. Naoto is going to be around more in 2018 and our goal is to cook together more often. Cheers to the last post of 2017 and hopefully more blogging in 2018! Is it too late to share a few pictures from Thanksgiving? It’s that time of the year again where I can’t believe it’s already December, yet this year seems like the loooooongest ever. My friend and I were talking about the famous Beyoncé pregnancy photo last night and I couldn’t believe that picture was from this year. (February to be exact.) Aren’t those twins toddlers by now? At the same time, I feel like summer was just here and we didn’t enjoy it enough and fall flew by in a blink. Let’s see how I do with my list. Anything special on your holiday wishlist? It’s that time of the year again–Phantom wine time! 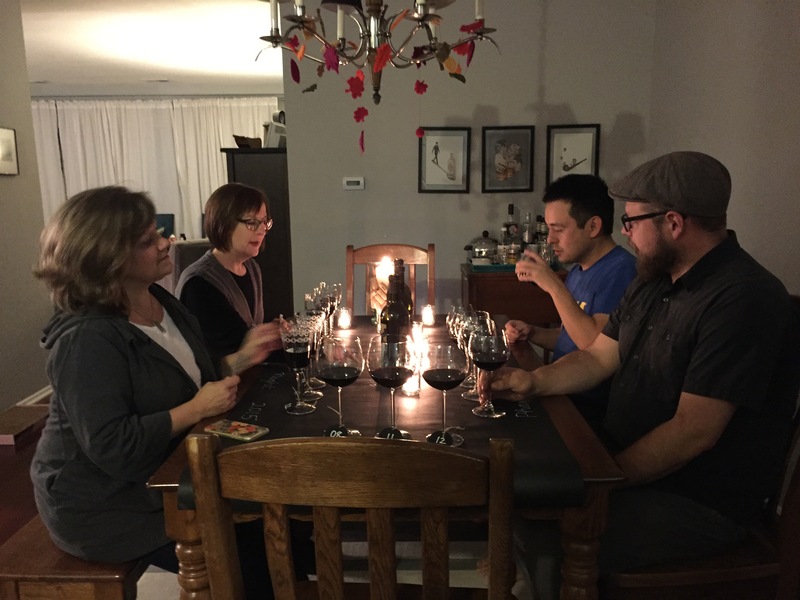 Earlier this month we hosted our THIRD annual Phantom Flight Night™, our little wine tasting gathering where we compare notes on several years of releases of Phantom wine. This year, we tasted 2011, 2012, 2013, and 2014. (2014 is available now at Trader Joes and other wine shops!) This year, I packed most of our Halloween decorations in the dining room since that’s where the party was. I labeled the bottles so we could easily identify the year and poured each person two ounces. This was the biggest Phantom Flight Night™ yet, so I had to borrow some wine glasses from Karen so we’d have enough for everyone. Karen brought her grandma’s wine glasses. As you can see, wine glasses (right side) were, uh, a little smaller back then. Karen made her fabulous homemade pimento cheese and we served meats and cheeses and minestrone soup. The “other Karen” made Lucky Charms treats which were amazing. This year, I printed some wine tasting wheels so we had some wine language to work with. I’m terrible at discerning different tastes in wine, so it’s nice to always have a guide and some Trader Joe friends who’ve had some wine tasting training. Even though I’m no sommelier, I still find comparing Phantoms interesting. The blend changes a little bit each year (for instance the 2014 blend is 42% Petite Sirah, 34% Zinfandel, 14% Cabernet Sauvignon, and 10% Merlot) and the finished wine is vastly different. Overall, 2012 came through as a favorite. Every year I love this party more. Mainly because it’s an intimate group of fellow wine lovers, but also because wine, snacks, friends…simple. It’s the perfect October tradition before the busy-ness of the holidays begins. Last Sunday I had a few people over for a letter writing party. I ordered the Party Pack, which was kind of a party-in-a-box with pens, confetti, and Write On packs for everyone, along with other goodies like a printable invitation, a letter writing themed playlist, and a Write On calendar and tote. I hung some vintage air mail envelopes and a Japanese air mail kakejiku (hanging scroll) from the ceiling and I strung up a few more air mail envelopes to make a garland. I covered the table in kraft paper and sprinkled the confetti along with some mail things from my collection. Each person got a Write On kit and a little brochure about letter writing. On the stereo, I had all of my mail themed rubber stamps and washi tapes along with some extra air mail envelopes, postcards, and my new Mr. Zip book. (He deserves his own blog post!) For snacks, I made a pot of tea and put out some Trader Joe’s truffles, some Japanese Happy Turn crackers, and I made these little envelope pies. I found the idea here–they were so easy and even though mine looked rather imperfect, they were a really fun addition to the simple menu. It was a relaxing afternoon of chatting and letter writing. We all really wrote letters! (I finished two!!) My only regret is that we didn’t have Naoto take a picture of us writing in action, but we got a fun group shot using Photo Booth (at the top.) I think I’ve said this before, but I love letter socials. Obviously letter writing is a good solitary activity, but sometimes it’s interesting to get together and share our hobby in person. I’m a little sad Write On is over, but the letter writing shall continue! I managed (thanks to a solid push to the finish line last night) to finish 31 postcards and letters and I’ve replied to everyone from my pile of overdue mail…whew! I need to give myself a pep talk to keep that momentum going in May! As promised, I’m going to share some of the food we made for the hanami party. The first is this spicy salad that we found on Cookpad. (Thanks to Jess for all of the hanami tips!) It is so fresh and delicious and I even think it would be tasty without the fresh fish. The wasabi-ponzu dressing is the highlight. Whisk the ponzu, oil, and wasabi together until smooth. Toss the vegetables, fish, and dressing together. Sprinkle with a bit of salt, if needed. Serve immediately. Feel the burn. Another fall, another Phantom Flight Night™. 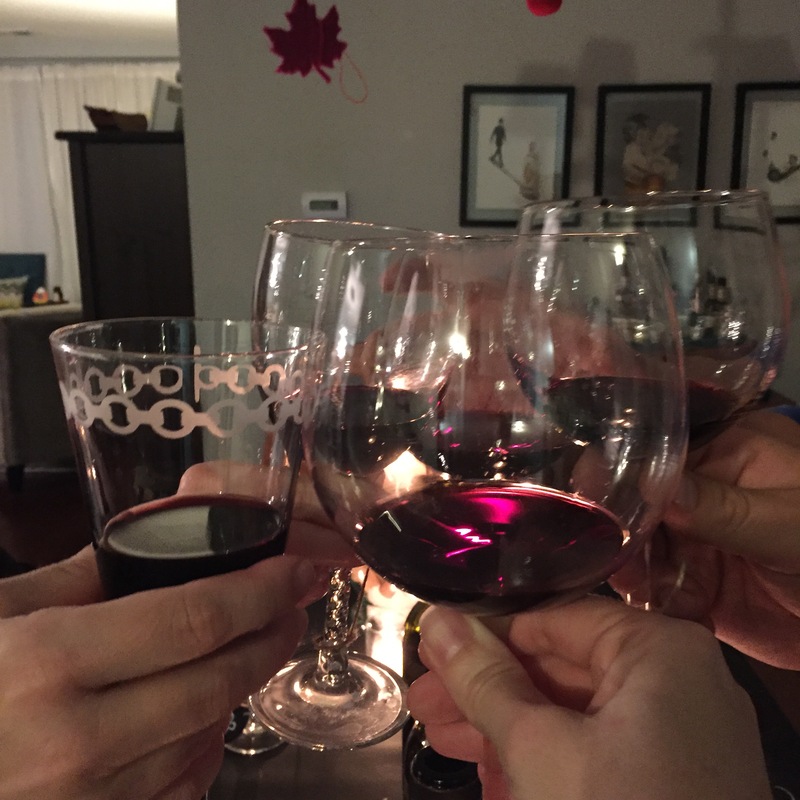 I just love this party…this year it was a small group, only four of us, enjoying Bogle’s Phantom wine from 2008, 2011, 2012, and 2013. Unlike last year, this bottle of 2008 was fine and delicious, though I can’t remember which one we liked the most. 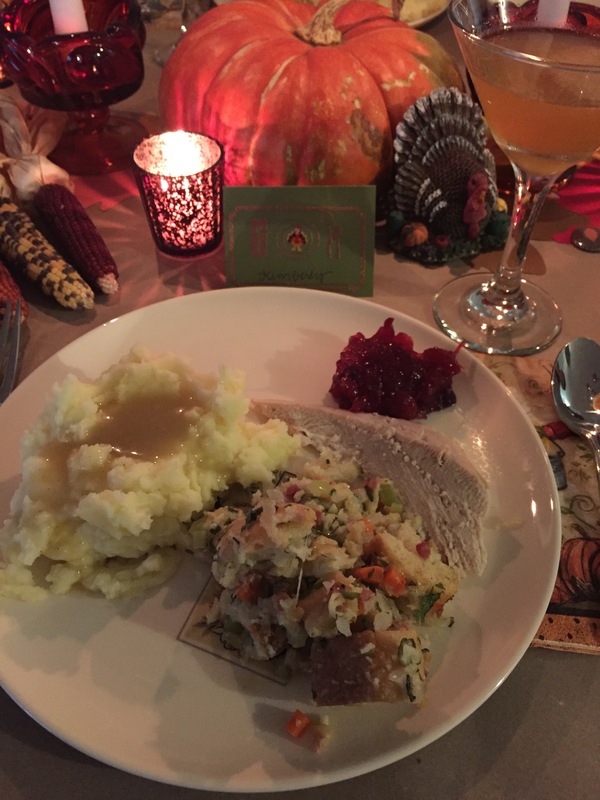 Simple decorations this year… We made this one pan Autumn dinner and it was amazing…apples, brussel sprouts, sweet potato…all the best of fall. It was a good night. Another Thanksgiving is in the books. 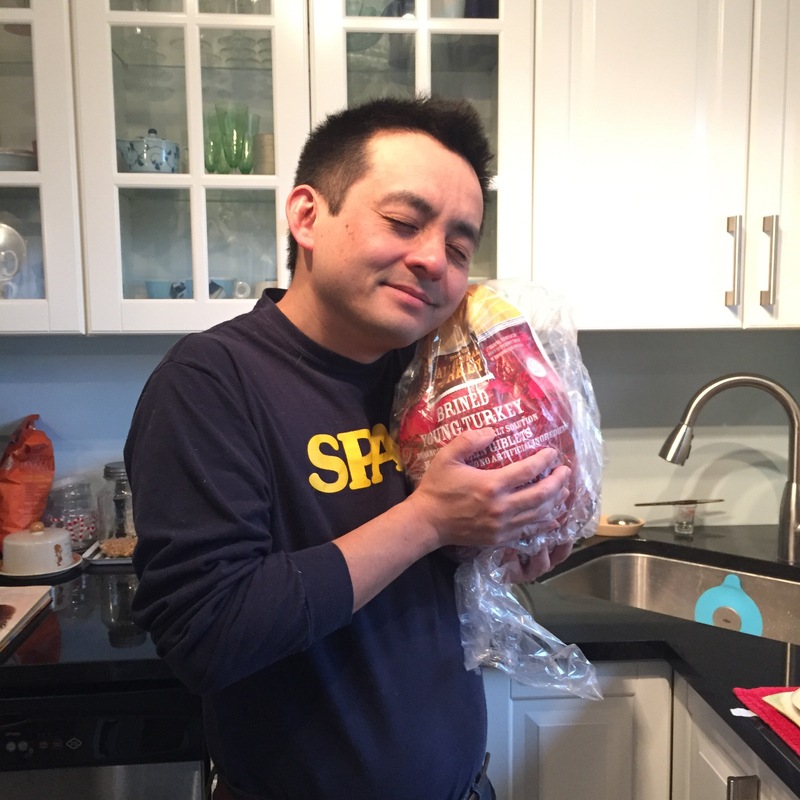 Naoto cooked a perfect turkey, his famous stuffing, and mashed potatoes. I made Kathy’s grandma’s cranberries and my mom made a veggie tray and a caramel apple cheesecake. Everything was delicious and the day was relaxing. We watched a lot of Leave It To Beaver…you can’t get more wholesome than that! 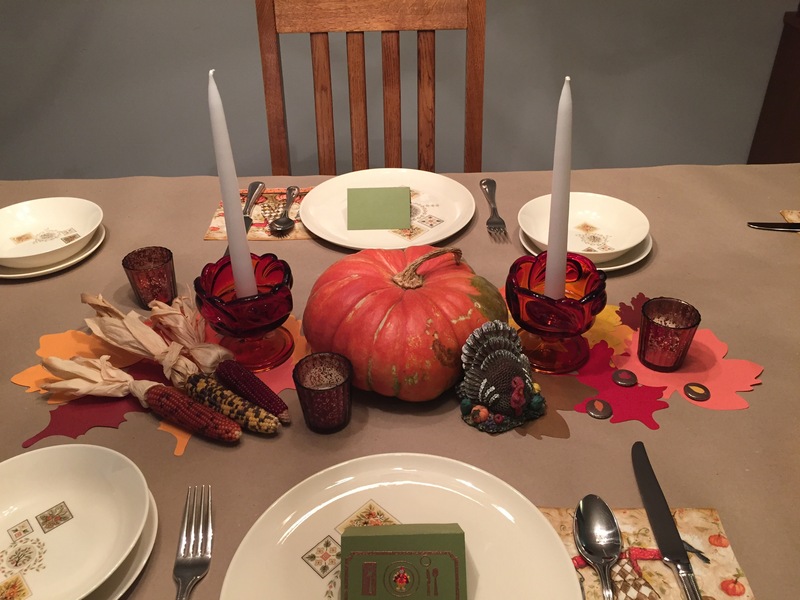 The table was really simple, just some paper leaves and the usual corn and turkey. Jackie gave me that fantastic pumpkin a couple months ago and it was perfect for the table! I found the candlestick holders at Goodwill last month and I loooooove them for fall. They fade from red to a golden yellow and are groovy-good. And I sprinkled my Field Notes Shenandoah leaf buttons on the table, too. Because I already had the cognac out and lemons squeezed for the cranberries, I made us some Sidecars. I spend too much time scoping out seasonal cocktail recipes (usually on Pinterest) but I always find that those are too sugary for my tastes. I can always find a good classic cocktail that fits the bill just fine. 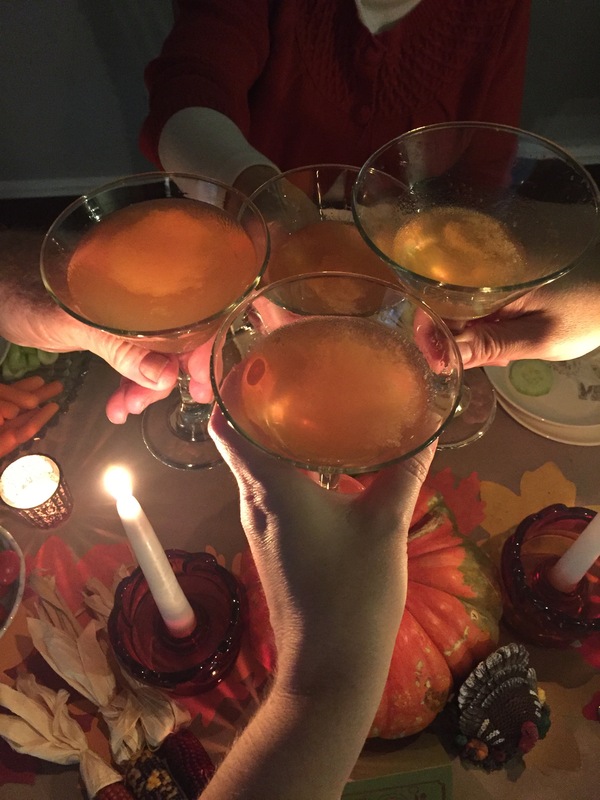 Since even my mom enjoyed the Sidecar, I think it will become a new Thanksgiving tradition. I made new place cards with my Yellow Owl Workshop stamp and stuck a glittery turkey sticker on the plate this year. 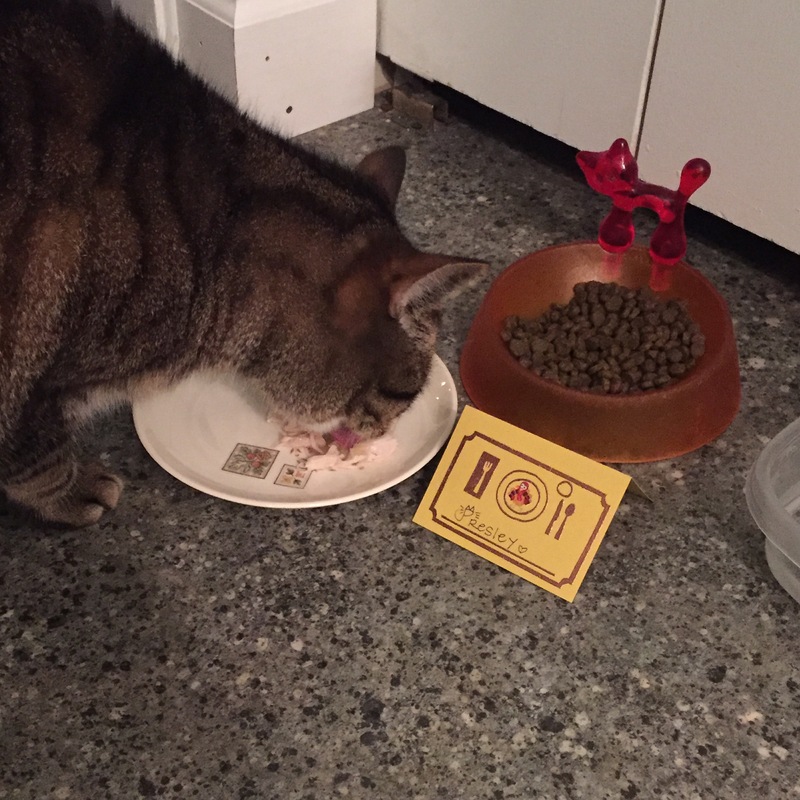 Even Presley got her own place card and plate of turkey and gravy! Today I’m going to finish putting away the Thanksgiving decorations and start pulling out the Christmas stuff. Naoto and I bought our tree last night so I’m excited to get started on the decorating festivities. I have strict feelings about waiting until after Thanksgiving to move into the Christmas season, but once Thanksgiving is over, I’m all in. How was your Thanksgiving? Did you try any new recipes I need to add to our list for next year? This week Naoto and I hosted Phantom Flight Night™, a little wine tasting party featuring a Trader Joe’s fall-favorite wine, Bogle Phantom. We have been accidentally collecting (hoarding?) Phantom since 2012 and we had bottles from 2008, 2011, and 2012 (available this year at your friendly local Trader Joe’s) so we thought it would be fun to compare the different years. Because Phantom is a blend, each year the grapes vary, so they end up being slightly different wines*. I love an intimate party, so we invited a handful of fellow wine-drinkers to help us polish off three bottles of Phantom. Even though it was a small gathering, I was determined to decorate a tiny bit. I love making paper table runners for parties. 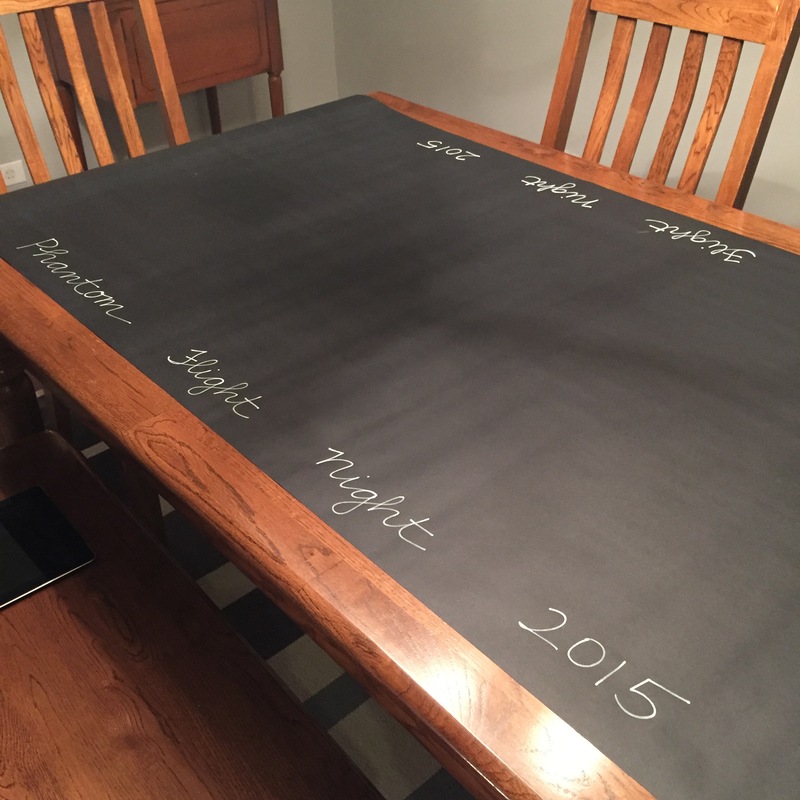 I usually use my kraft paper but I wanted something dark for PFN™ so I used black wrapping paper and wrote on it with a chalk marker. Someday, maybe I’ll learn calligraphy and I will be able to make the runner really fancy! I added a big candle nested in old wine corks at the end and labeled the wine bottles in the center. Then I went through all of our wine glasses and found a group of three alike for each person. (I didn’t realize how many wine glasses we have around here. I think we need to have more wine parties and use them more often!) 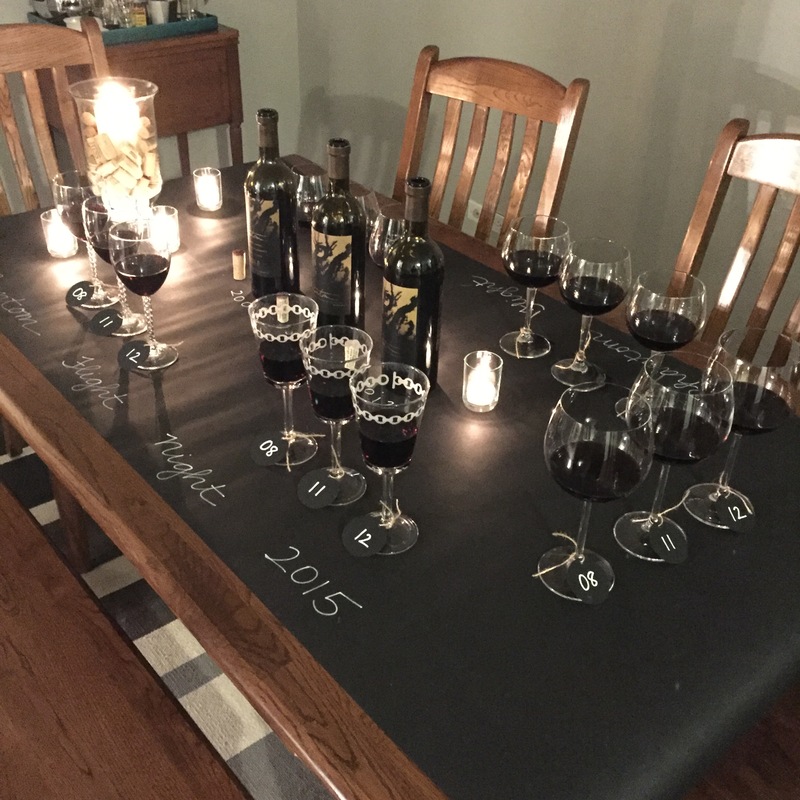 I labeled each glass with a year marker made from black cardstock cut with a 2-inch circle punch and tied on with twine. (This may have been overkill since we stayed at the table for most of the party.) About a half hour before our guests came, I poured three ounces of wine from each year into our glasses to give the wine a little bit of time to breathe. I figured three ounces was a decent pour for comparison, and then we could fill our glasses with more as needed, and open a new bottle of 2012 if we really wanted to get crazy. (It was a weeknight so no one got crazy, sadly.) 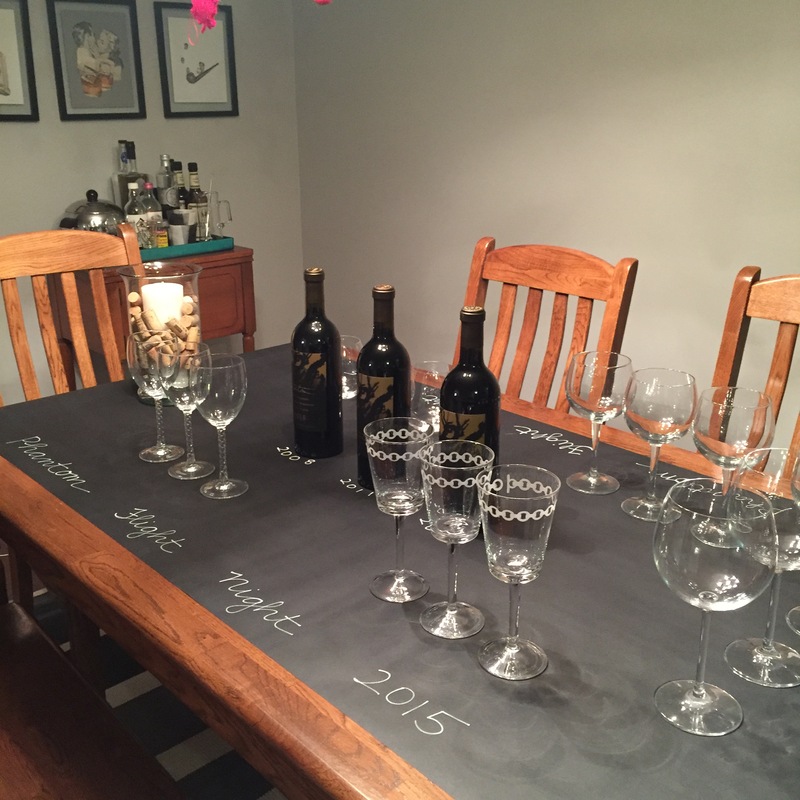 We tasted each wine in order of year and wrote little notes on the paper at our place setting. It was fun talking about the wines even though we were all far from wine experts! Next time, I’ll have copies of tasting notes for everyone–something like this one–to help us express ourselves more, but as it was, we had a fun time laughing about our comments while we tasted. We all loved 2011 the best and we decided that the 2008 was beginning to “turn”. (I guess I won’t be saving our last bottle of ’08 for Phantom Flight Night™ 2016.) 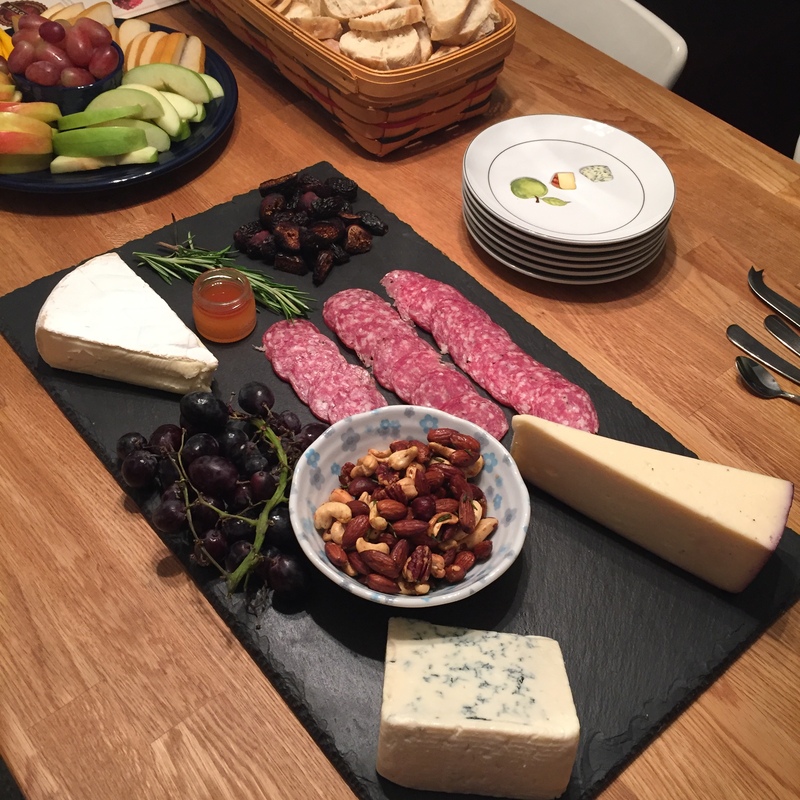 In the kitchen, we served cheeses, dried figs, salami, grapes, fruit, nuts, chocolates, and a Trader Joe’s shrimp appetizer–simple bites to complement the wines. I’m already dreaming of Phantom Flight Night™ 2016…in October, with a Poe reading by Naoto. Look for that blog post next year! P.S. Unfortunately, this post was not sponsored by Bogle or Trader Joe’s, even though it kind of sounds that way. Extra special thanks to James for coining the name Phantom Flight Night™! *Phantom 2008 is made from 51% Zinfandel, 47% Petite Sirah, and 2% Mourvedre and 2011 is made from 46% Petite Sirah, 40% Zinfandel, 11% Cabernet Sauvignon, and 3% Mourvedre. I couldn’t find the grapes used in 2012, but I’ll update the post if I find that information! I hosted book club on Saturday morning. I knew, since we were going to get home late from the Blackhawks game Friday night, that I wouldn’t feel like getting up to bake muffins or something in the morning. So, I tried to think of something tasty that I could make a day in advance, that would still taste fresh and “homey” the next morning. Then the idea of a yogurt bar popped in my head and I decided that would be easy enough, even if I made homemade granola instead of serving store-bought. 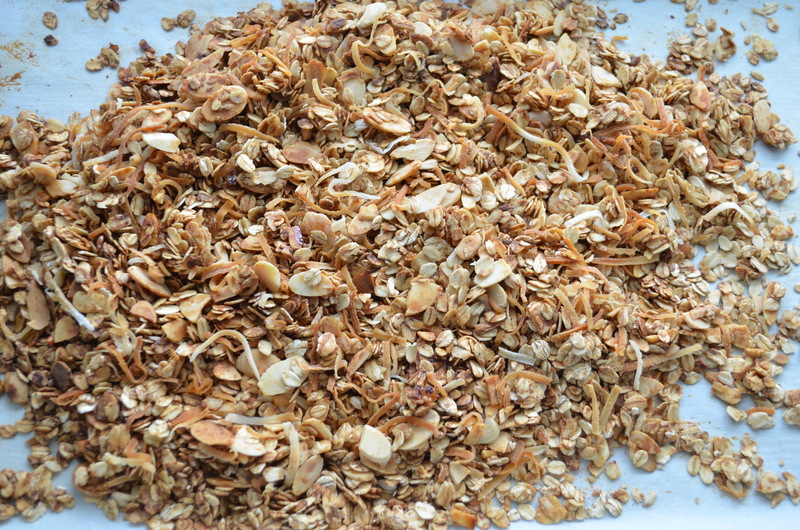 On Friday afternoon, I whipped up a batch of granola and even though I followed the directions to the letter, the granola was over-toasted. It wasn’t really burnt. (I still liked it, but I also like my toast one step below blackened.) But the coconut was really toasty and it kind of affected the taste of everything else. I didn’t feel like I could serve it to guests. So, I gave it another go and so I’m sharing the recipe and method that worked best for me in hopes that no one else will burn their coconuts. Place shredded coconut on baking sheet and put in oven to toast separately. I left my oven door open and stirred every minute or so for about 4 minutes. You can also toast the coconut on the stove using the method explained here. 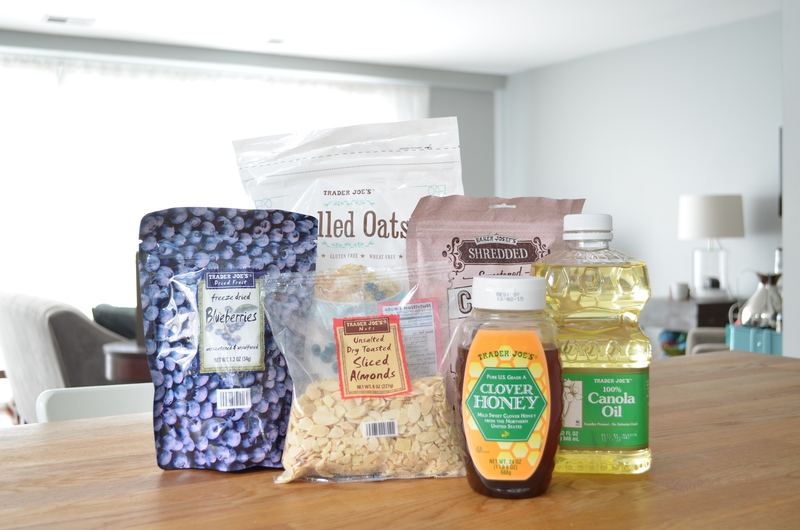 Once the coconut is toasted, add it to the oats and almonds and allow to cool. Stir in the dried blueberries and it’s ready to eat! I served mine with vanilla yogurt and fresh raspberries and blackberries. I think the book club enjoyed it, too…either that or they’re a bunch of good actors! 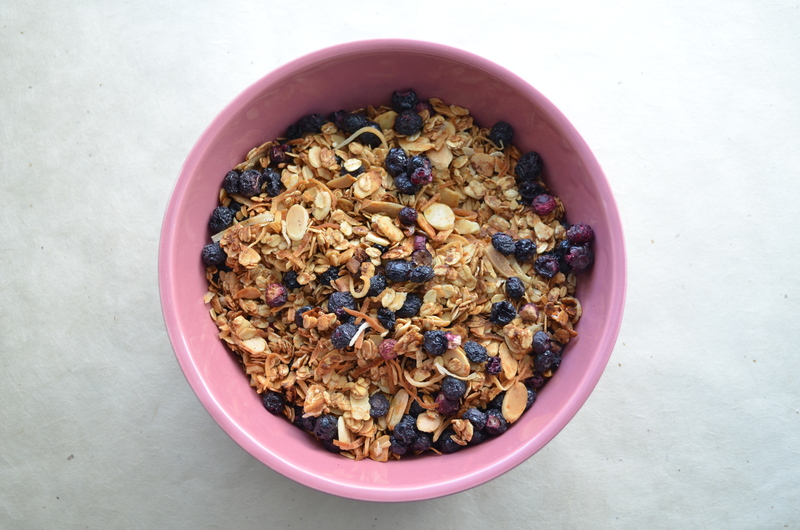 The granola is a lot less sticky sweet than store-bought granola but you don’t really miss the sugar because the toasty, oaty deliciousness is enough. And I have to say, even my coconut-hating husband liked it!